Emergency exit landing place at PS/IS 217, what children are expected to navigate through under stress in an emergency. 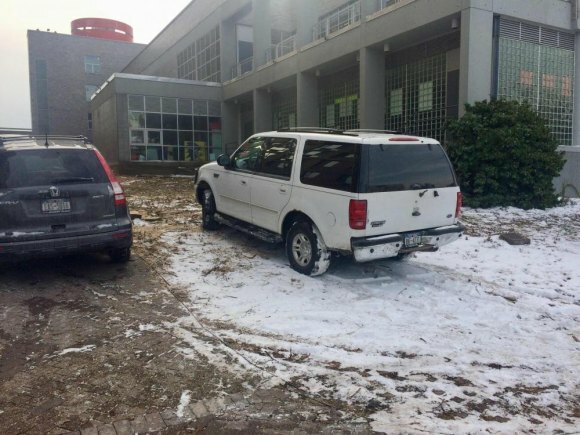 Two years ago, residents protested PS/IS 217's destroying a half-dozen trees in what appeared an effort to create more free parking for teachers and staff. The rats were exposed later. But the school denied that intention. You can take a look for yourself. It doesn't seem that long ago that Roosevelt Island's only public school was an eye-pleasing showcase. 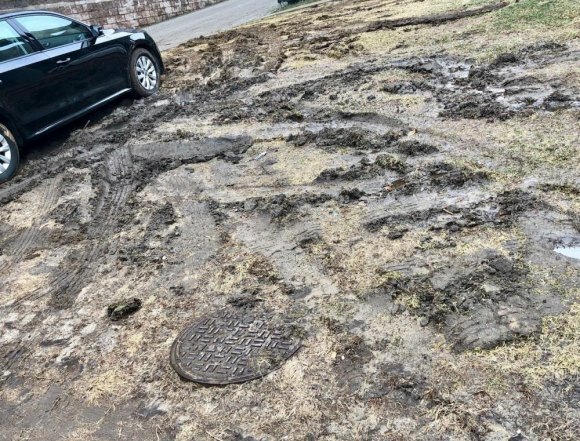 PS/IS 217's now mud-scarred lawn teaches local children that free parking comes first over community esthetics. A small garden beneath a bay window bloomed with patriotic designs on the Fourth of July. In the window itself, you could see a reminder of the City's funky Cow Parade featuring playful bovine statues placed all around town. The lawn between school building and promenade was replanted with fresh soil cultured with healthy grass. 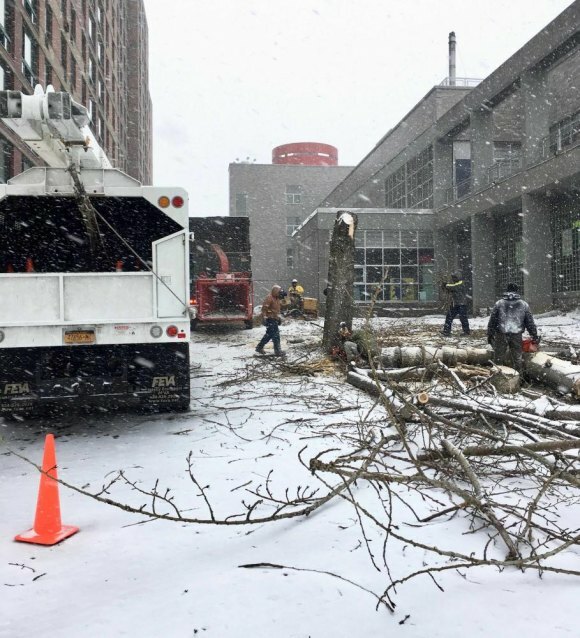 PS/IS scheduled removal of the trees for a snowy, Saturday morning. Near the north end, a plaque with a shady, accompanying tree honored legendary author Alice Childress, a Roosevelt Island pioneer who spent her last years here, helping to start the volunteer library that was later adopted by the City system. 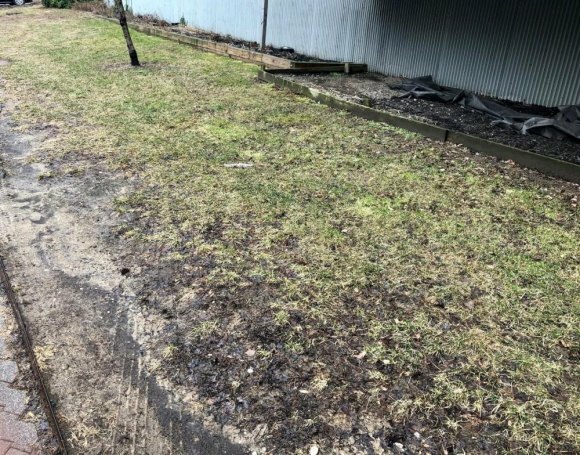 Once vibrant flower beds abandoned. To save it from the free-for-all of manic parkers actively destroying the lawn, RIOC rescued the Childress plaque and gave it a respectful new home near the Meditation Steps. Vehicles were quick to fill up the space, once the trees were gone. The Alice Childress plaque, tree already removed, is visible on the right. 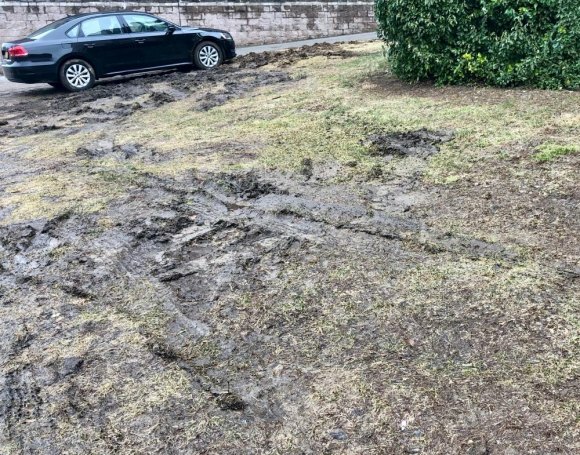 The way cleared, teachers and staff have now wrecked the lawn, turning it into a muddy mess marred with car tracks across its entire length. Free parkers destroyed Roosevelt Island's traditional Z-bricks in the scramble for space. 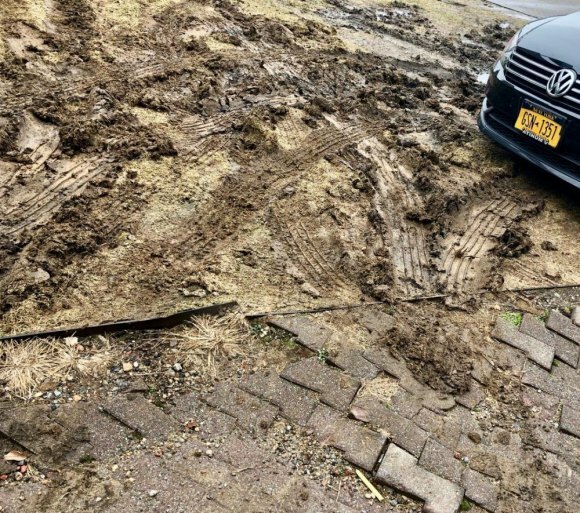 Children who might need to use the school's emergency exit will be forced to find their way under stress through ruts of mud and damaged Z-bricks.